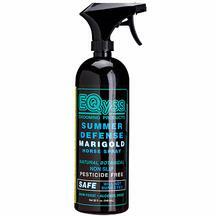 Premier Marigold Horse Spray is a unique botanical product containing no insecticides or pesticides, silicone, wax, or oil. It will not damage or dry out a horse's skin or hair. It is not harmful to horses or humans and can be applied to human skin, too. Skin and hair are not damaged or dried out. Can spray safely on face and ears. Will not burn eyes. Superior natural fly repellent. Rated #1 by The Horse Journal. "Gentlest and best smelling product tested"